On Saturday, September 20, two groups of scholars presented evidence for the true location of Fort Caroline, the first permanent settlement by Europeans in what would later become the United States. First settled 450 years ago, the location of the actual fort has been lost to the ravages of time. Tradition holds that Fort Caroline was located on the St. Johns River in modern-day Jacksonville, Florida. 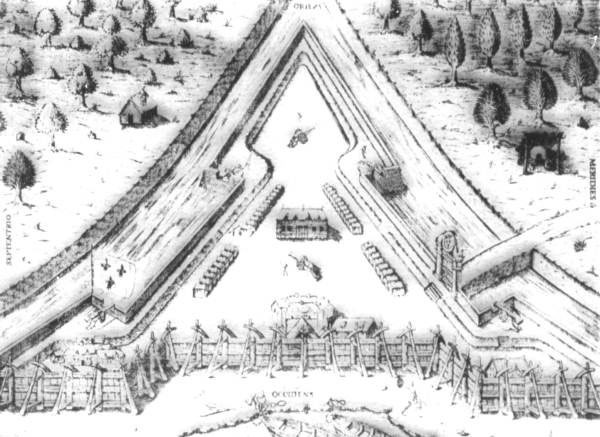 Yet in February two scholars announced that they believed Fort Caroline was not in Florida at all but instead was on the Altamaha River in modern-day Darien, Georgia. Controversy ensued and thus the Jacksonville chapter of the Archaeological Institute of America decided to hold a debate on Saturday at the University of North Florida to let both sides put forward their evidence for where they believed the fort was located. The master of ceremonies of the event told the packed UNF auditorium the ground rules for the debate. Both sides would get 30 minutes to make their arguments with a question and answer period at the end. 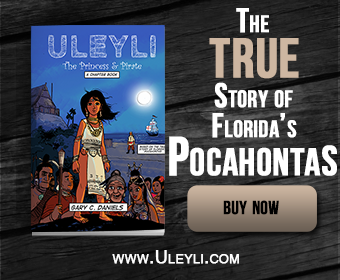 Dr. Robert “Buzz” Thunen from the Anthropology department at UNF would present evidence in the affirmative as to why the St. John’s River was the true location of the fort. Dr. Anita Spring from the University of Florida and Dr. Fletcher Crowe from Florida State University would present evidence in the negative for why the St. John’s River could not be the river on which Fort Caroline was located. Dr. Thunen went first and presented a great overview of all the archaeological work that had been done in the Jacksonville area to find the remains of both the French fort and the Native American tribes with whom the French interacted. The amount of work done in the area over the past 50 years is quite impressive. Yet despite all of this work Dr. Thunen had to admit that only one small piece of evidence had ever been found that supported the assertion that the St. John’s was the location of the French fort. Dr. Thunen showed a small ceramic fragment of a French pot that had been found along the St. John’s River. Thus after all the years of excavations, this one small fragment was the best evidence found to date that supported a French presence on the St. John’s River. Dr. Anita Spring and Dr. Fletcher Crowe made their presentation next. They noted they had gone back to the original French documents written by the very Frenchmen who built Fort Caroline and developed of list of 36 characteristics that the site of the French fort would have to meet if it was to be considered a possible site. They noted they had applied this list to the St. John’s River and only found a correlation between 33% of the required site characteristics. They noted they applied this same checklist to several other rivers such as the St. Mary’s River along the Georgia-Florida border and the Altamaha River in Darien, Georgia and got a much higher correspondence. Both rivers matched over 70% of the site characteristics needed if the French fort was to be located on either river. During the question and answer period the main complaint from the audience seemed to be that Dr. Anita Spring and Dr. Fletcher Crowe did not present any maps showing where they thought the fort was located. Both scholars noted they were working under a non-disclosure agreement that prevented them from sharing the possible site locations in order to prevent damage to the sites from looters. Dr. Thunen also noted that the St. John’s River had changed significantly over time and the river we see today is not how the river would have been 450 years ago. He argued that this negated the 36 site characteristics the opposing side had used in eliminating the St. John’s River as a candidate since they were comparing the modern river and not how the river was when the French first settled there. Dr. Fletcher Crowe noted that this was incorrect since they did, in fact, use maps of the St. John’s River going back as far as the Revolutionary War and that these maps showed the river had changed very little over the past 200 years. Overall it seemed the audience in attendance was left wanting more than what either side could give. Only future excavations and research will answer the question once-and-for-all.